Fueled by a desire to reach people for Christ, a revolution is underway. Churches are growing beyond the limitations of a single service in one building. Expanding the traditional model, they are embracing the concept of one church with more than one site: multiple congregations sharing a common vision, budget, leadership, and board. 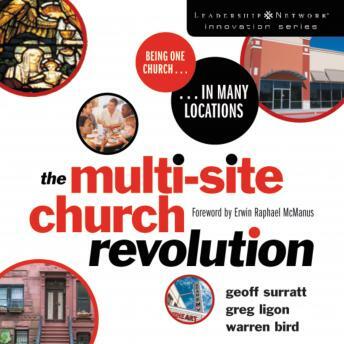 Drawing from the examples of churches nationwide, The Multi-Site Church Revolution shows what healthy multi-site churches look like and what motivates congregations to make the change. Discover how your church can:  cast a vision for change  ensure a successful DNA transfer (vision and core values) to its new site  develop new leaders  fund new sites  adapt to structure and staffing change  use technology to support your worship services you'll identify the reasons churches succeed and how they overcome common snags. The Multi-Site Church Revolution offers guidance, insights, and specific action steps as well as appendixes with practical leadership resources and self-diagnostic tools. "I wholeheartedly recommend this book for any pastor or church leader who needs to know the pertinent issues, tested solutions, and real examples of multi-site strategies that are currently being deployed around the world." -Ed Young, senior pastor, Fellowship Church "The authors have done their homework. They have firsthand knowledge of the successes and failures of this movement, having been networking with and facilitating dialogue among churches across the country for years." -Max Lucado, senior minister, Oak Hills Church "Look no further than this book to propel your ministry to Ephesians 3:20 proportions: exceeding abundantly above all that you could ever ask or think!" -Randy and Paula White, senior pastors, Without Walls International Church This book is part of the Leadership Network Innovation Series.